Retirement News > Pensions > Articles > What is your Pension Really Worth? Lots of people plan to retire on a pension and Social Security with little savings. They have never done any serious retirement planning or sought any professional help. That can be a very big mistake unless they have taken into account the damage that can come from future inflation. 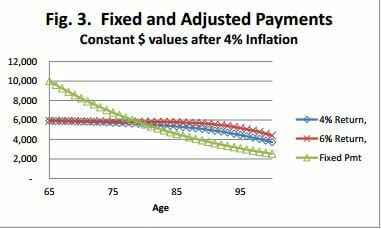 Inflation for retirees is a very serious matter. My own pension lost 30% of its purchasing power in the first ten years. Inflation compounds, just as do returns. My father retired in 1965 and lost considerably more than that on his long-term bonds because of the oil crisis and Carter year’s inflation. 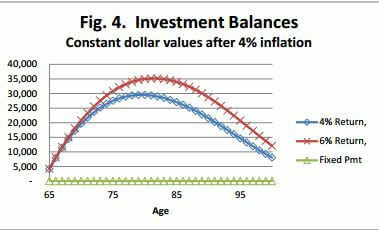 During those years, inflation destroyed 49% of the value of a dollar in just ten years. See Figure 1. During my father’s time as well as my early years of retirement, medical costs rose at about the same rate as the Consumer’s Price Index, CPI. That’s because there were less exotic medical treatments and drugs. Drug bills of $1,000 a month or more were unheard of as were hospital bills of thousands each day. The fact is that retirees, especially those who are less healthy or elderly, will face inflation much higher than the general population. Fig. 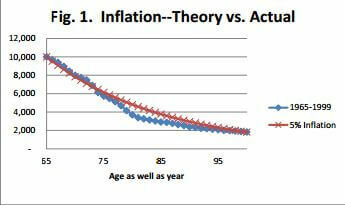 1 shows how dramatically inflation destroys $10,000 fixed payment annuity or pension. Most people assume that inflation in the past was always around 3% but it has gone as high as 13.3%. For most of the period after World War II, inflation averaged over 4%. For the 35 years in Fig. 1, inflation averaged 5%. The often quoted 3% inflation rate includes the years of the Great Depression and the Price Controlled years of World War II. That’s not to say that we, too, won’t face depressions or price controls, but the need to print money with our current national debt problem points to higher inflation, not lower than historical averages. I’m now telling people that, at the very least, they should multiply their estimated after-tax payments from a fixed pension or annuity times their age divided by 110 to get a better idea of its value in an inflationary environment. I used to say to divide by 100, but I now believe that future returns will be lower than the past, and I believe that we will see inflation higher than the 3% often quoted. Employers often mislead employees about the value of a pension. People who are getting close to retirement should look at the payments they are promised from their pension realistically. Employer quotes of future pensions can be terribly misleading. They may assume some wage growth that older employees are unlikely to achieve. They may not show the sizeable reductions from including a spouse as a beneficiary. And they won’t show the deductions for maintaining an employer offered health insurance program nor withholding. Even worse, they certainly won’t show the effect of inflation either from now until they retire or the devastating results after retirement. Retirees on fixed income really feel the pinch from inflation. That’s why we try to find inflation-adjusted income from secure sources. But even those will not keep up with the kind of inflation many of the elderly will find with ever increasing medical costs. Corporate and municipal bonds are extraordinarily vulnerable to inflation. Bond funds will do worse when interest rates start to rise. More secure and inflation-adjusted investments are Savings I Bonds, Treasury Inflation-Protected Securities (TIPS) that are laddered and held to maturity, and inflation-adjusted annuities. It’s getting harder and harder to find the latter because insurers are afraid of what might happen to inflation in the future. That’s true of long-term-care insurance as well. How about those who have already retired? Many people have already retired on a fixed pension or a fixed payment annuity and have too little savings. They have already faced the reality of what spousal benefits, insurance deductions and withholding mean to their take-home income. They don’t want to pay for professional advice, and they don’t want to take the time to make a plan of their own using a free Web program. So, what’s a quick way to estimate how much they can really afford to spend? If the savings are barely enough to provide reserves for an emergency fund and high value replacements like a new automobile, then they must rely on Social Security and a pension if they have one. If they have savings in addition to an emergency reserve and a reserve for known large future expenses, they can get a fair idea of how much additional income they can get from investments (less reserves) by dividing the remaining investments by what they think may be the longest number of years they might still live. This, in effect, is what the government makes you do when you take Required Minimum Distributions (RMDs) from an IRA after age 70 ½. The RMD factors are life-expectancies plus about ten years in the seventies going down to about three years more than life-expectancies if you would live to 100. People who have not reached age 70 yet could use age 95 less their current age to come close to the RMD assumptions for those younger ages. 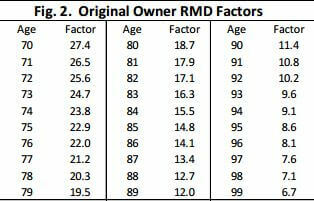 See Figure 2 for a RMD table from IRS Publication 590, Appendix C. Half of the population will live past life-expectancies, so you have to plan for the 50% chance you will live longer. The extra years included in the RMDs do that nicely. The theoretical assumption behind the analysis above is that the after-tax return equals inflation in each year, but it turns out that from a practical standpoint, this fits the experience of many retirees except in very recent years when it has been difficult to get such after-tax returns on fixed income securities plus miserable stock performance. What if you are contemplating buying an immediate annuity? You might first look for an immediate annuity that’s truly inflation-adjusted, not one that says payments will increase at 3%. You should also look for a competitive quote for a fixed payment annuity. Assuming that both come from very high quality insurers and have the same survivor options, you can use one of the immediate annuity programs from www.analyzenow.com to see which is best for your case. If you can’t do that, you can get a reasonable idea which might be best for you by multiplying the quote for the fixed payment annuity times your current age / 110 as above. If the resulting payment is significantly better than the inflation-adjusted quote, go for the fixed payment IF you feel you can maintain a separate reserve with secure investments that will have returns that are close to, or better than, inflation. Such a reserve might be dominated by Savings I Bonds or TIPS. The former is better for a non-qualified account (taxable) and the latter for a qualified account (IRA). If you choose the fixed payment immediate annuity, then you can use some simple math each year to determine how much you must save from each payment for future inflation protection or how much you can withdraw. You are going to be your own inflation insurance company. This has an advantage. If you die early, your heirs will inherit this reserve—or in some bad emergency, you could choose to use this reserve until you can sell your house or try to make up the shortage some other way. That’s all there is to it. Figure 3 illustrates the differences between simply spending all of the after-tax money from a fixed payment pension or annuity versus using the simple calculations above each year. It’s not perfect inflation protection but it has the advantage of you having the investments from it rather than the insurer. See Fig. 4 for investments. Figure 3 shows that spending the whole of the after-tax payments requires a drastic change in life style throughout retirement as did my father how downsized his home three times. Early in retirement, a retiree can spend a lot more, but this advantage disappears about at age 77. For the following twenty years, the adjustments really pay off. And those years are when health care is really expensive. The other telling difference between the two methods is what happens to savings. When you buy an immediate annuity or get a pension, it’s the insurer that has your savings—and you can’t get them back. With the adjusted payment method you build up some savings. This is illustrated in Figure 4. If you end up using the investments for something else and can’t restore it, perhaps the worst that can happen is that you go back to the fixed payments spending at what will amount to greatly reduced purchasing power as illustrated with examples in Figures 1 and 3. If you haven’t done any retirement planning, do it NOW! You are going to be spending the last quarter to a third of your life without wages, and the future may be even tougher than the past. If you would like to find out how much lifetime retirement income your savings could buy or want to look for a competitive quote for a fixed payment annuity, check out our Free Lifetime Annuity Calculator. Continue Here to See all Ask Bud questions.